Starting with the XS and XS Max, the main difference between the two is the Max's larger 6.5-inch display, which among other things allows for a special landscape user interface. The jumbo sized iPhone also gets a larger battery that lasts an hour longer than the smaller 5.8-inch iPhone XS, a handset that already bests last year's iPhone X by up to 30 minutes. The XS uses the same Super Retina Display, except it now offers 60 percent better dynamic range and the ability to view HDR photos and video. A big plus is the updated speakers, which now boast wider stereo sound thanks to software tweaks. The glass covering the XS has been upgraded to be more durable and scratch resistant, and wireless charging is now faster. We're not sure what gains Apple was able to build in, but we'll be testing that out come next week. The XS series also upgrades to IP68 water resistance, allowing it to be submerged in up to 2 meters of water for half an hour. Face ID is a lot snappier thanks to enhanced algorithms and a faster secure enclave. All three new phones sport Apple's A12 bionic chip, which packs 6 cores: two high performance cores and four efficiency cores. The two high performance cores are up to 15 percent faster, while the four efficiency cores use up to 50 percent less power than the A11 Bionic chip in the iPhone X. An even bigger difference comes with the GPU, which now has four cores and is up to 50 percent faster than last year's SoC. That's a pretty huge jump for graphics, but it gets even better. There's a new 8-core neural engine that can run five trillion operations per second, compared to 600 billion on the A11 Bionic. Moving onto camera changes, the XS has a new dual-camera system, featuring an enhanced true tone flash and a new sensor with deeper pixels that will result in better low-light photos. The image signal processor now works together with the neural engine, allowing for better depth tracking, facial landmarking, red eye reduction and segmentation masks to make portrait blur even better than before. There's also a new Smart HDR feature that leans on the neural engine to combine multiple exposures to make a single, great-looking HDR photo. Apple claims the process is so quick that there is zero shutter lag. Apple built in depth control for adjusting a Portrait Photo's depth of field after the fact. Not only that, but Apple has added realistic bokeh that actually morphs instead of just getting smaller or larger when you adjust the f-stop slider. For video, the XS has better low-light performance, extended dynamic range when shooting at 30fps and stereo audio recording. The front-facing camera now shoots 1080p video at up to 60 frames per second and also features all-new video stabilization. This year's top-of-the-line iPhone benefits from Gigabit-class LTE for even faster download speeds. And if you're a traveler and have two different phone numbers or service plans, you can now use both on one device thanks to eSIM technology. All three new iPhones and the new Apple Watch Series 4 all come with Bluetooth 5.0, which offers better range and connectivity. Prices start at $999 for the XS and $1099 for the XS Max, both of which come with 64GB of storage. Models with 256GB of space are priced at $1,149 and $1,249, respectively, while the top-end 512GB models come in at $1,349 and $1,449. Pre-orders for the iPhone X start on Sept. 14, with the first wave of devices scheduled to arrive on Sept. 21. Onto the iPhone XR, the mid-tier offering features a lot of the same changes that are seen in the XS, except it's missing a few things here and there. First off, it comes in a much wider range of colors: white, black, blue, yellow, coral and (PRODUCT)Red. The chassis is made from 7000 series aluminum instead of surgical grade stainless steel, though both front and back are covered by glass panels. It has an edge-to-edge screen, just like the XS, except instead of a Super Retina OLED, the XR includes a 6.1-inch Liquid Retina Display, which is an advanced LCD display. It also features Apple's updated Face ID, just like the XS, and comes packing the same wide-angle camera. Marking a departure from past iPhones, the XR can shoot Portrait Photos with its single lens. Even better, the XR packs the same features like Portrait lighting, Smart HDR, bokeh and depth control, better low light performance and stereo audio recording. On the front side, you get the same new 7MP camera, Portrait Selfies and access to both Animoji and Memoji. Inside, the phone is powered by an A12 Bionic chip with newly updated Neural Engine. Just like the iPhone XS, the XR sports Bluetooth 5.0, dual SIM capabilities, updated durable glass, wireless charging, available fast-charging and a larger battery that lasts up to one and a half hours longer than the iPhone 8 Plus. Pricing starts at $749 for the 64GB model, and it's only $50 more for the 128GB model. The maximum capacity 256GB model sells for $899. Apple is slated to begin preorders for the iPhone XR on Oct. 19 ahead of launch a week later. I hate these "everything you need to know" headlines. 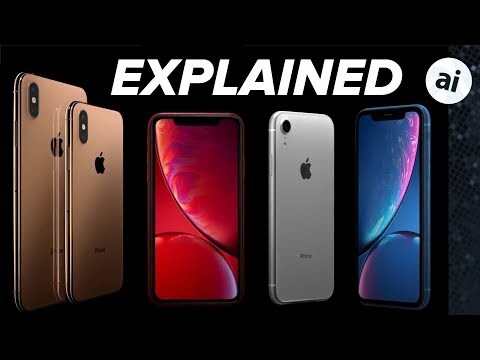 You know what I need to know about the new iPhones? Literally nothing. Obviously I'm a hardware junkie, I'm here chatting about this nonsense. But if I knew nothing at all about new iPhones my life would go on unchanged. Well it sounds like you are wasting our time... and yours. I have an iPhone 5s that I bought right after the launch event. It has been an excellent phone. I replaced the battery awhile back to get a bit more life out of it. I also have an Apple Watch Series 0. Finally, I carry a 7 Plus for work. It was purchased for the purpose of battery life maximized when tethering. The 5s is AT&T while the 7 Plus is Verizon. I really like that the XS supports 2 SIM cards and can be on more than one network. In theory this could allow a person like me to only carry around one phone. Unfortunately, the work phone has added encryption requirements for email and VM Ware AirWatch (security policy) that I am required to have enabled, along with a second Apple ID. Alas, the hope of consolidating to one phone while still keeping personal data, apps, and email totally separate from work doesn’t seem possible at this time. (Nope, I can’t use Apple Mail with 2 separate accounts in this particular case). There likely are many others who have a scenario similar to mine that is less stringent who CAN drop down to carrying one phone). Having both AT&T and Verizon on the same phone would be awesome. 128 GB is what I see as the minimum on board storage to have based on my use. What I like about the XR is that the price difference compared to an XS would allow me to purchase a new phone to replace my 5S AND also upgrade my Apple Watch for $49 more than an XS alone. One thing that spooks me: why isn’t Apple offering the XR as “carrier free” (unlocked) at this time? There are some nice features of the XS over the XR, but to me, the upgrade of the Apple Watch at the same time outweighs those benefits. My 5s is a good lesson that performance specs are what gets longevity out of a phone, at least in my case. I know that there is appeal to not being on the “S” upgrade cycle for many due to new form factors, but the S series (3GS, 4S, 5S) has worked well for me. The end of carrier phone subsidies did influence my not staying on a 2 year upgrade cycle of the past and being content with “good enough”. I will miss the smaller form factor of the 5S. I guess I heard that the Xr lacked 3D Touch during the presentation. I would be glad to be wrong. The XR has haptic feedback but no 3D touch which is fine by me I'll be going from a 6 to an SE to an XR. It'll make it more like my iPad. 5 trillion operations per second is HUGE. And the hardware knows how to delegate it to CPU, GPU or neural engine. At some point the phone might become faster at these special operations compared to an intel laptop that doesn’t have that in place and running much more efficiently. What I can imagine is that macOS is also less optimized for this type of optimization. Perhaps we will start to see ‘iOS Pro’ for laptops that take iOS further by allowing window overlap and mouse control. Apple says they keep things separate but in the end they benefit from having one operating system branch. I personally like macOS because it’s more open and allow app installations outside the App Store, but I can imagine there’s an audience that doesn’t care about that. Or maybe Apple will for ‘iOS pro’ allow full apps to run through server side (running in the cloud) to avoid security issues yet opening up their ecosystrm more. One thing you need to know: there’s no 5G. okay, optical stabiliser for telephoto Lens is eventually there. Thumbs up. And, at this point, it's unneeded. The standard is barely there, and large-scale rollout is still a ways away. I get it that there are lots who don't upgrade every year, so they want future-proof features, but Intel isn't quite there yet with the chipsets Apple would need to have 1 world phone, as these are (with the exception of China). Even Samsung doesn't offer a true world phone. There are different versions for different markets. I will miss the smaller form factor of the 5S. No "SIM free, works with any carrier"
I agree on the the upgrades to the watch outweighing those of the iPhone. That's not, in any way, to trash the iPhone upgrades. It is merely because the watch is its youth becoming an adolescent while the phone is reaching middle age... Plus, Apple appears to be putting a huge amount of effort into the watch. And, I agree with the lack of a small form factor. I think Apple needs one. Actually, I think the more interesting effect of the new(er) phones is on the iPad Mini: The XS Max is getting real close to that size. But, so far, the Mini is still alive and kicking, just getting a little old in the tooth. So, does that mean that these phones will be effectively obsolete by this time next year? I'm not sure when Apple has had unlocked iPhones on launch day, certainly not in the last few years. When I bought an unlocked 7, it wasn't available for a month - 6 weeks after launch. It will likely be late November - early December to get an unlocked XR. That was back when Apple was in the process of switching to Intel modems. So that may have been the delay. And, I hate the use of the word "locked". It's very misleading. A carrier can "lock" any phone it its network. And, by law, they have to unlock it once it is paid for when ask to by the phone's owner. That is very different than buying phone that has modem only capable of working on one type of carrier network -- where an AT&T phone cannot ever be made to work on a Verizon network because the modem can't handle the CDMA signals from Verizon. Few, non-Geeks, understand that and get find that to switch to their preferred carrier entails buying a new phone -- even if their phone has been UnLocked! Whenever they can put a camera and all other sensors underneath the display then there will be no notch. But that requires some new technology! 5G will take a long time to be a thing, and until we have speeds that takes advantage of it, no sense on a using high energy usage modem just for the sake of it. umm? 5G is being rolled out now. In addition, most who buy a high end phone now will keep a number of years. So soon it will be like having a WiFi A/B/G router after N was released. The XS is showing as being able to be ordered without selecting a carrier. XR requires a carrier name. I’m hoping this will be changed online shortly; just want to confirm that there are no modem compatibility issues. A bit harsh. It's a nice catch-all article about what was announced. I'm sure it'll be helpful to a lot of readers who don't actually post here.